C’est la rentrée. It is the time when France sees the annual migration of its people returning from rural or maritime retreats to the great conurbations. John Egan describes a sense that times are changing – in France and Europe. France’s president Emmanuel Macron has made his rentrée with energy and aplomb. His goals, and those of his parliamentary majority led by Prime Minister Édouard Philippe, are no less than a total structural transformation of French society. It will be “révolution copernicienne” President Macron has promised. At its centre, this revolution has a vision of a Europe in which social protections are tightly interwoven into the fabric of a free market economy. It will be a Europe that protects its citizens and, for this to happen, Brexit is more an opportunity than a threat. The first domestic manifestation of the new regime is a wide-ranging revision of French labour laws – fundamentally freeing up the labour market, particularly for small and medium enterprises. The aim is to reduce unemployment from the 9 per cent level above which it has stubbornly remained, despite all the policies of the previous president, François Hollande, to address this issue as his number one priority. 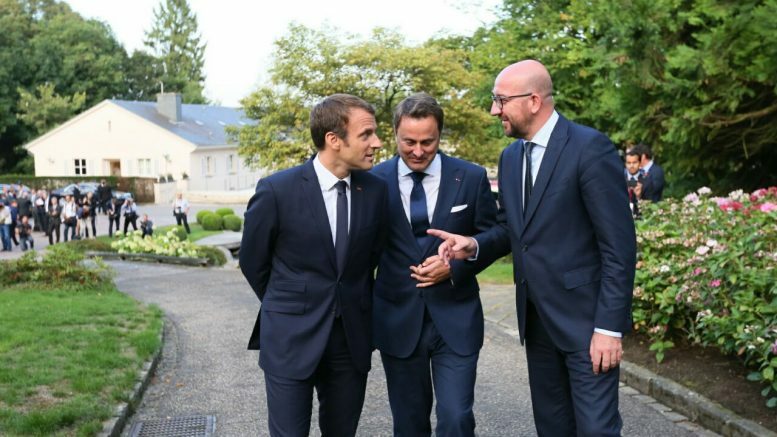 Labour reform has captured this week’s headlines, but a visit to Luxembourg where Macron met with Prime Minister Xavier Bettel and Prime Minister Charles Michel of Belgium, speaks louder as an indication of what may follow. Bettel and Michel are among a new generation of pro-Europe leaders that Macron wishes to galvanise to pick up the mantle of the European Union (EU) project founders and deliver reforms on a grand scale, starting with a profound political and economic integration of the eurozone – something that has long been resisted by London. For Macron, the leaders of the EU have a choice – to manage the disintegration of the Union through long discussions on Brexit and perhaps with other departing countries, or to be part of a political generation that rebuilds Europe. It is either a race to the bottom in terms of social protection through unfettered competition between nations or a harmonisation of social and fiscal practices across Europe. “The eurozone over the last five years has never dared to come together as an entity. Why? It was thought that this would have angered the United Kingdom and Poland. Have they thanked us? Are they any more attached to Europe?,” asked Macron. The rhetoric weighs heavily on the Brexit outcomes and recent conflict between Warsaw and Brussels over the independence of Poland’s judiciary. Better integration across Europe in the social, fiscal and security spheres is where the new initiative is heading. Attacking “social dumping” by reforming EU “Posted Work” legislation, harmonisation of tax and co-ordination of the controls of European borders are some of the initial steps. Macron has proposed a dozen in total to relaunch the economic and monetary union through the deep integration of the eurozone. It is not expected that 27 member states can move together. Europe will advance at varying speeds and the eurozone should be in the vanguard. Of course, it is essential to have Germany on board, whatever the outcome of the federal elections in three weeks’ time. Initial signs are positive, though Macron has had to prove his euro-credentials with plans to bring the French budget deficit to below 3 per cent of GDP. This task is made all the more painful by the need to fill an €8 billion hole discovered in the French national accounts in June – requiring a change of tack that has lost Macron 24 percentage points in his approval ratings as well as the leader of his armed forces. One might even interpret Macron’s domestic policies as moves to make France better prepared for a closer European integration. The change to the labour laws, for example, moves the country closer to the normal practices of neighbouring economies. Next on the domestic list for reform are unemployment benefits, security and terrorism, access to higher education and housing and public finances. The transformation of a retirement and pensions system that Macron has described as complex and unjust promises to be particularly thorny when it is introduced next year. Progress in many of these domestic areas may be facilitated by Macron’s ambition for Europe. His longer term strategy may be to recognise this synergy and orchestrate effective European integration as a means to achieve his domestic aims of improving the French economy and the security of his citizens as part of a greater Europe. The stakes are high. By constructing a win-win outcome for Europe and its nations, the European project will be delivered and many will be proud to be part of the European family. Failure is likely to result in a profound anti-Europe backlash. In relation to all of this, Brexit is a sideshow. It cannot be expected that the UK will receive any special treatment unless it can contribute positively to Europe’s future.